Prior to being matched with an opportunity, PVN Patient Partners receive orientation, training and ongoing support. This helps to prepare them to have an impact once they participate in an opportunity. We have created resources to build the skills of our patient and health care partners. For patient partners, resources include how to communicate health care experiences, teleconference etiquette, and how to join webinars; for health care partners, we have a readiness checklist and FAQs regarding our engagement request form and evaluation process. We help a health care partner clarify the aims of its opportunity, how it will engage a patient, and criteria for identifying patient partners with relevant interest and experience. Often we encourage health care partners to include more than one patient. We post the opportunity on our website and include it in an engagement opportunities newsletter that is sent to our patient partners every Tuesday. Typically the opportunity is open for two weeks. Interested patient partners fill out an online form, answering questions that help the health care partner identify if they will be a good fit for the opportunity. We send the list of candidates to the health care partner, and then provide assistance to determine which one best fits the opportunity’s needs. We then host a discussion so that the health care partner and patient partners can meet each other, discuss the opportunity, and ask questions. We regularly check in with both the health care partners and patient partners after an opportunity begins. 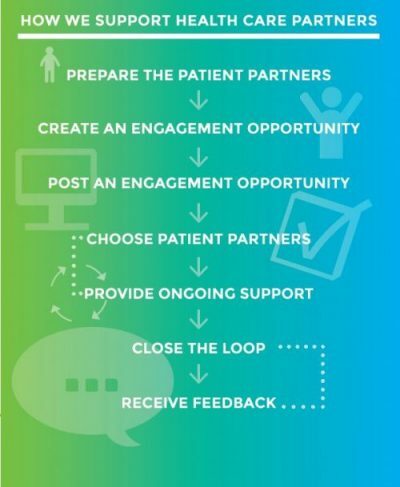 Along the way we collect feedback so that we can continuously improve our own processes; feedback is also passed to patient and health care partners to aid their participation in future engagement opportunities.